Above...Group photo of Convention Attendees. Were you there? 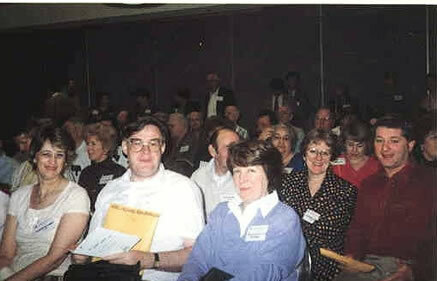 The 1993 Convention commenced at 3.00 on Friday 5th February with registration. Time between to relax and meet other atendees to the first convention. 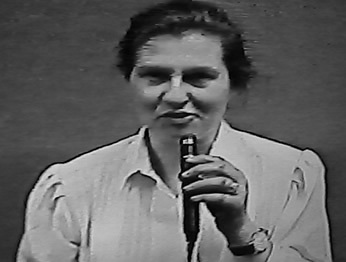 Dinner was served at 7.00 with Evelyn Twiss, 1992 Hall of Fame Honoree presiding. Speakers that evening included Marion, Lady Langham,(1994 honoree) and Patricia McCauley from the pottery with the latest news from County Fermanagh. On Saturday, events got off to any early start at 9.00 with Angela Moore, President of the Collectors Society discussing topics of interest, the forthcoming 1993 Ireland Tour and finishing with a Chapter Groups questions and answers session. Gene Krach 1991 Honoree then entertained with an informative slide show presentation. There was a dealers display in the Hollywood and Glendale rooms as well as Swap Boards, Special Belleek Exhibition and a lecture on the restoration of Belleek by Andrew A Owen director and founder of Phoenix Restoration in the Pasadena room. Sunday's events included lunch presided over by Don Clinton, 1990 Honoree. 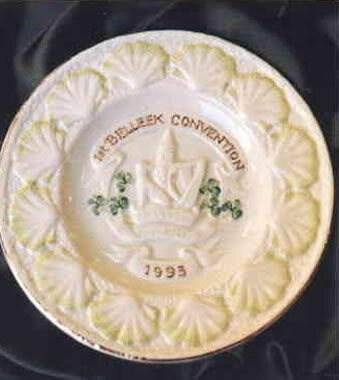 After lunch, George Moore Owner and CEO of the Belleek pottery addressed the convention. The theme of his speech was "Where we are and where we're going". 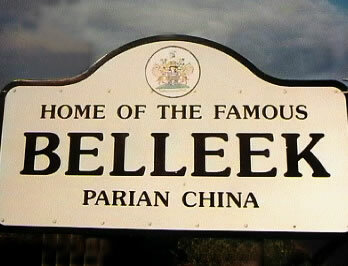 Later that afternoon, Richard Degenhardt presented a talk on "Belleek through the Years". Later that evening everyone gathered for a Gala Dinner Dance with music from Des Regan and his Irish Band. All too soon the evening came to a close with the official closing of the convention at 11.00pm. 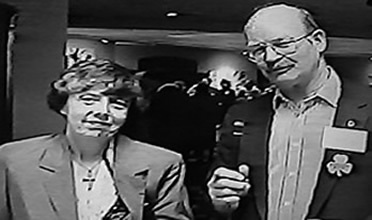 The convention committee was formed from the Los Angeles Chapter, Evelyn Twiss, President, Dr Irwin Steinberg, vive President, Pat Busk, Secretary, Charles Oster, Treasurer, Margaret Thompson Hospitality. 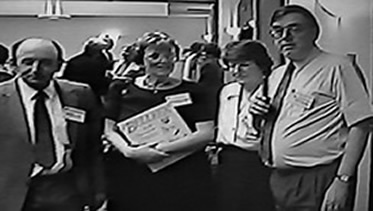 They were ably helped by Margaret Adam, Kay Brotsis,Evelyn Clark, Betty Clinton, Don Clinton, Andy Oster, Maxine Steinberg, Elizabeth Stilwell and Bill Twiss. 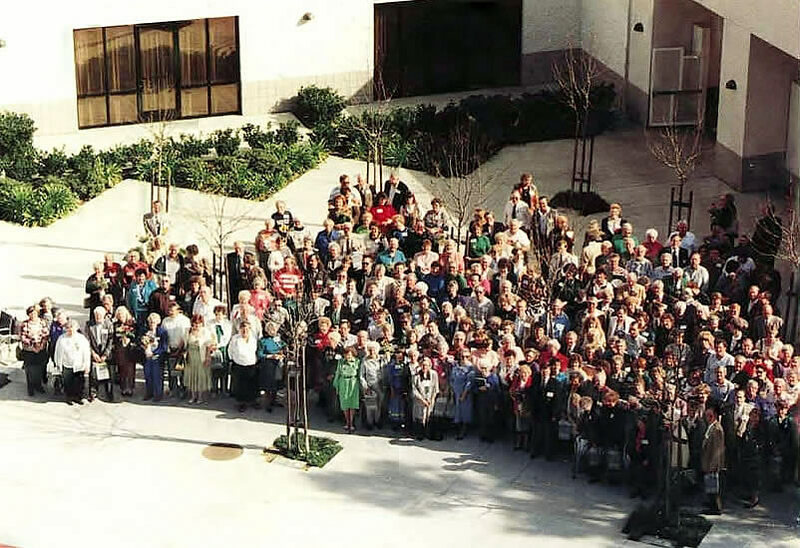 The convention was a huge success, setting a high standard for more wonderful gatherings over the following years. The UK Group spent a few more days in the area and were invited to visit and stay with George and Angela Moore at their home. 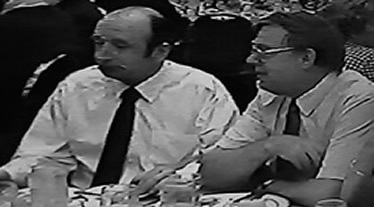 Below, images captured directly from the convention video which unfortunately has not lasted that well over the years.